Welcome to our Community Spotlight, a series spotlighting our favorite creatives that are making their mark in the world. Today we're chatting with Annie of MontgomeryFest, who talks about taking chances as an entrepreneur and how it has allowed her to grow both as an individual and as a small business. She also happens to have some of the most gooorgeous watercolor hand-lettering! Read on to find out how she got her start, as well as for some great advice for those looking to make a start of their own. MontgomeryFest is a design-focused travel and lifestyle website. We blog about our expat life and adventures around London and heading off to travel the world as often as we can. The shop is filled with quirky, travel-inspired art pieces that work perfectly in a gallery wall or as a fun, stand-alone treasure. 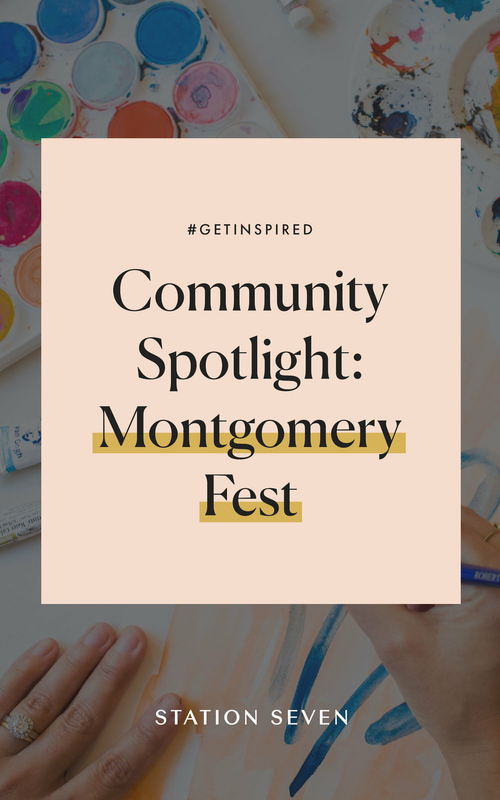 How did you get started with MontgomeryFest? In 2012, my husband, Justin, and I got married and were itching to experience another part of the world. We threw it out to the universe and Brussels, Belgium it was! I started writing the blog as a letter home. It quickly grew into a way to keep track of our travels and keep me accountable to the ever-growing memory cards of travel photos and the stories each new city told. With Europe as our playground, the inspiration was everywhere. I picked up a paint brush to jazz up my blog posts with graphics for Pinterest. I received so much lovely feedback that it quickly moved beyond blog posts to commissions. The idea of my art being used in people's homes around the world absolutely warms my heart. I launched the shop this past year and currently offer hand letterings and watercolor paintings. It's been an adventure in itself to see how MontgomeryFest has grown throughout the years. Playing the marketing role in my small business. I am a creative, not a salesman. My husband is an accountant, so he handles the business side of things and we both prefer to work diligently behind the scenes. Painting and putting my art up for sale in the shop is the easy part. When it comes to marketing myself and my products, I am completely out of my comfort zone. Budding as an artist. I've always loved to draw and paint, but it wasn't until I started sharing my work that my creativity really soared. Not everything has been an obvious success, but every time I put something I've made out there, I've pushed my boundaries and learned more about myself and my process, what works and doesn't work. It can be pretty intimidating and vulnerable, but that growth is the overall win. We purchased the Coastal theme from Station Seven and blocked out a week of time to learn the code we needed to customize it to fit MontgomeryFest. Since we rarely use code, it was a challenge, but a fun project to learn together! Jump in. If you wait until it's perfect, you'll wait too long. If it excites you and inspires you, put it out there. You'll learn much more along the way than you will waiting to make it perfect beforehand. I'm @montgomeryfest on Instagram, Twitter, Facebook, Pinterest, and Bloglovin'.